Christmas and the holidays have arrived and they are the warmest holidays that I have had in recent memory, other than a trip I took to Hawaii in 2012. Woohoo! As a teacher here in Chiang Mai, Thailand I had 10 days off and my girlfriend had 5. 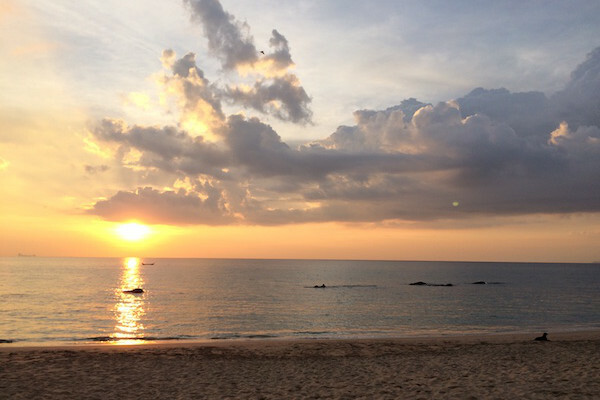 We always like to take advantage of time-off and travel but this time of year is especially busy and expensive as Thailand is a popular international destination. 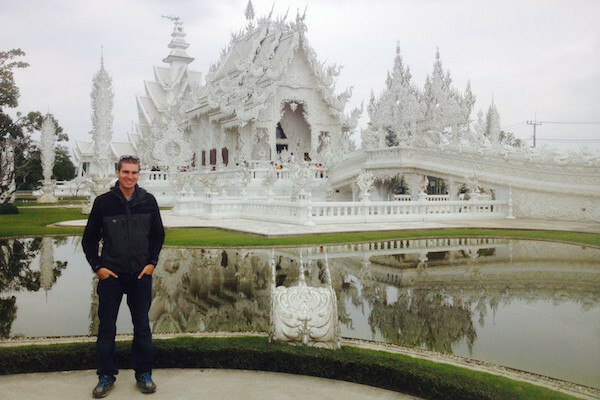 With limited time off, we opted to take a trip, traveling to Kanchanaburi, Thailand. 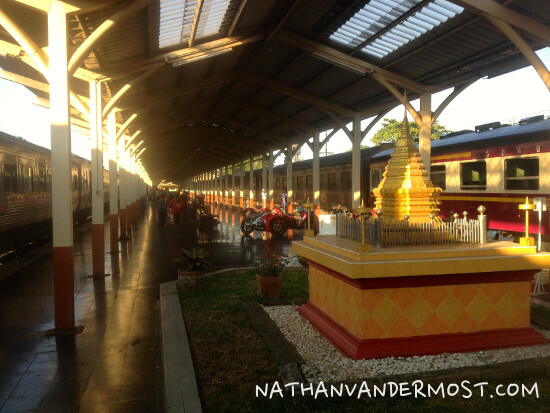 We choose to take an overnight train from Chiang Mai to Bangkok and then a connecting train to Kanchanaburi, Thailand. It is a small quaint town with a lot of historical significance. 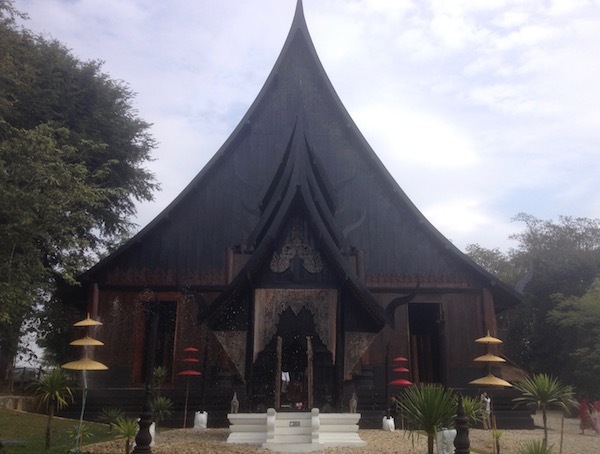 I have read about other travelers going and wanted to check it out myself. I was pretty excited about taking an overnight train. I have taken the train once while traveling in the south of Thailand. 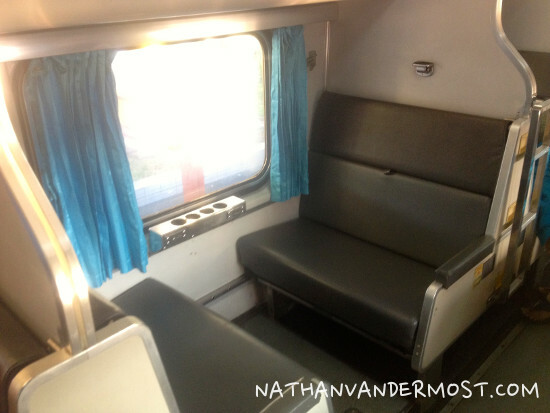 You can read more about that trip in my post titled, Thailand train travel. My girlfriend is an experienced Thailand train traveler and based on her experiences claims that traveling by train is relatively easy. Comparatively to planes, the train is a lot slower but is 50% of the cost depending on the time of year that you are traveling and the destination. The best way to get information on timetables, train stations and other relevant information is to visit the Thai railways website. The cost of each route depending on the train car class can be found HERE. Lastly, a time-table which is smartphone friendly can be found HERE. The availability of tickets varies depending on time of year and destination. 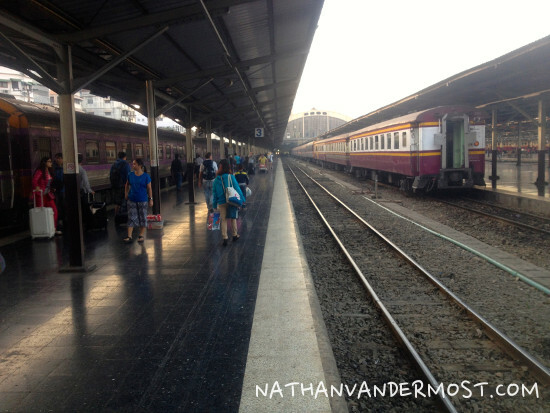 We started by taking a 12 hour train ride to Bangkok, arriving to the Hua Lamphong railway station at 7am. While riding in 2nd class, the train car is equipped with seats that convert into beds so you can get some sleep. Once we arrived we had one hour to make our transfer to the Thon Buri station via Taxi before taking a connecting train to Kanchanaburi. 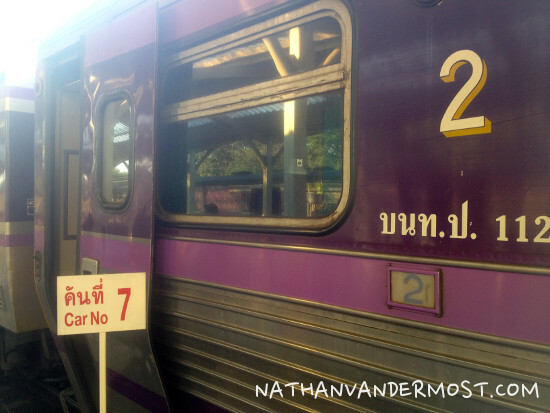 We found a taxi quickly and made it to the Thon Buri Train Station. Adjacent to the Thon Buri train station is a large food market. We had our choice of chicken feet, animal organs and other Thai delicacies. We opted for two coconuts and some pineapple. 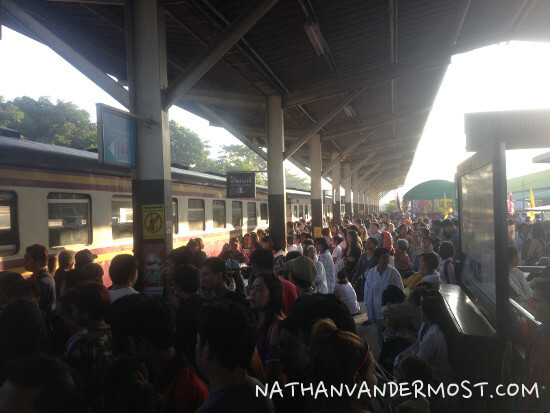 The train station was quite crowded as it is a popular time of year to travel, especially for Thai people. Fortunately, we were able to get a ticket for 100 Baht each or $3 USD to Kanchanaburi. We rode 3rd class because that is all available on that particular route. Although the tickets are cheap, if there are more people than seats then you might be standing in the aisle during the ride. The ride took roughly 3 hours. 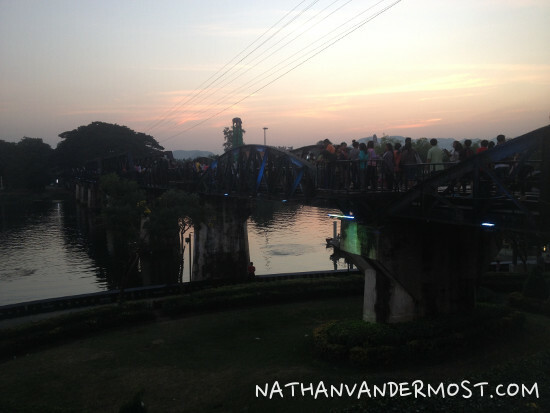 After 18 hours of travel from Chiang Mai, we arrived to Kanchanaburi. 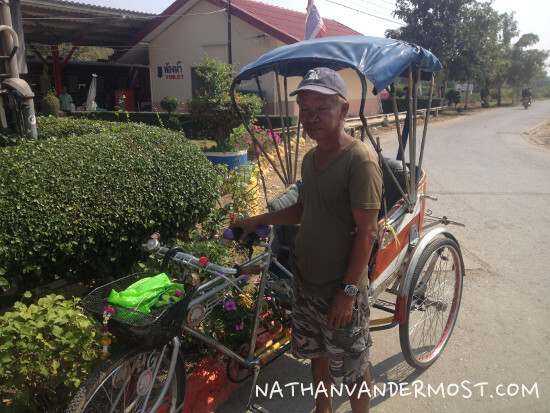 When we departed the train in Kanchanaburi, we got bombarded by drivers asking if we wanted a ride, including a rickshaw driver who has been riding for 32 years! Whoa! After looking at a local map, I figured that walking into town would be just as easy. There are travel friendly guesthouses and foreign restaurants that line that main strip of town. 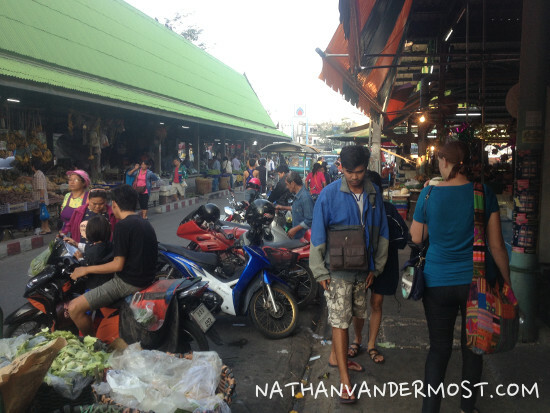 We grabbed some food and rented a motorbike for 200 Baht per day. Since living in Thailand I own a motorbike and feel relatively comfortable driving around. It is the best transportation option to avoid getting ripped off by local taxis. After my girlfriend and I grabbed food and got a motorbike we were off to find our hotel. Since I tried to reserve an accommodation two days prior to arriving for New Years Eve, everything in town was fully booked. Fortunately, I found a place outside of town called, The Legacy River Kwai” that was available. Unfortunately, it was the worst experience that I have had staying at an accommodation in recent memory. 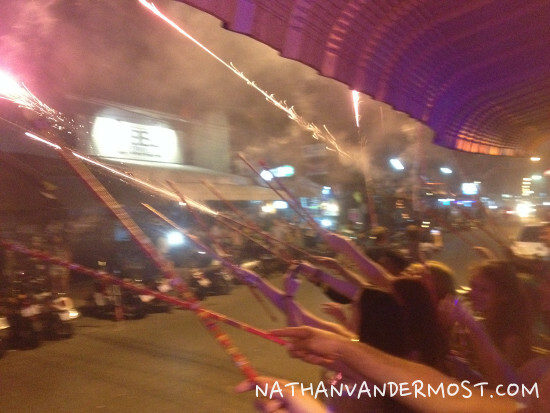 After arriving and getting settled at our accommodation, we decided to drive back to town to spend New Years Eve in Kanchanaburi. 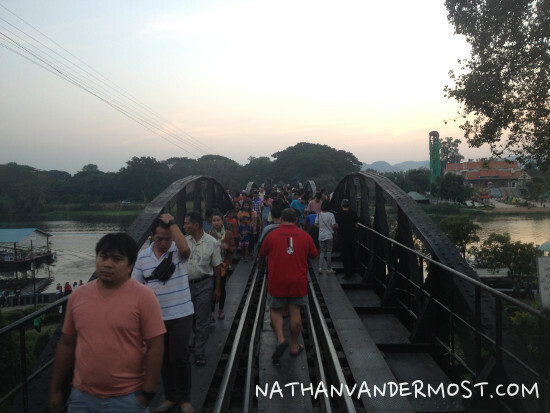 We went to the railroad bridge that crosses the river kwai and is a significant historical site. There are many restaurants that line the river and a local market with live music. We had dinner at an all you can eat buffet for 250 Baht or $7.60 USD and spent the rest of the evening socializing with other foreigners and locals to bring in the New Year of 2015! 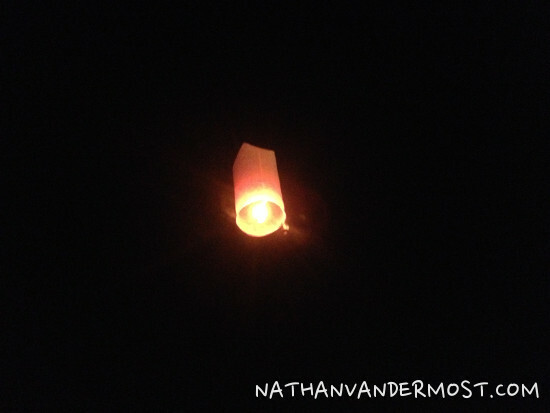 It was an eventful evening and I am thankful for all the adventures that I have had this year. 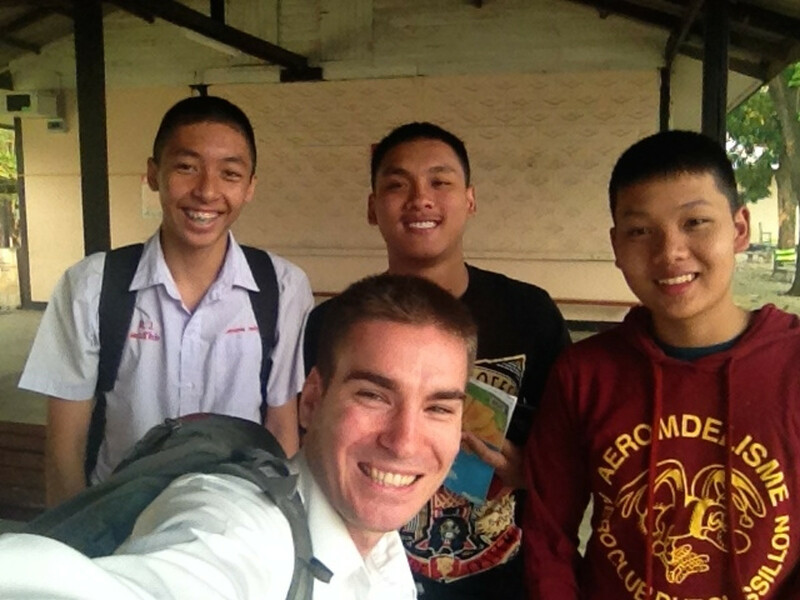 Stay tuned for future posts on Kanchanaburi, Thailand!